We know from the experiences of several of the men that the surviving members of 21 BDS spent a very uncomfortable night huddling by, and under their remaining vehicles within the hamlet of Les Moulins. We also know that on D-Day plus 1 that time was spent returning to the beach to try and salvage equipment even though it was still under frequent enemy fire, not only from snipers, but from mortars and 88mm shellfire. The accounts from the men tell us that contact with other parts of the Omaha Beach invading force did not occur until the morning of 7th June when US forces came down the road from St Laurent and made the first contact with the beleaguered RAF team. Further up the valley close to the edge of St Laurent, as late as the morning of D-Day plus 1, fierce machine gun exchanges were being carried out by US forces and the Germans who still controlled the strongpoint WN 69. However once this battle had been neutralised the remains of the RAF convoy were given authority to move up the valley but to turn left along a narrow track which led them to clear pastures and a plateau above the beach where they were to make their first base. This area was within the designated field boundary of USAAF Advance Landing Ground A-1 St-Pierre- du-Mont / St Laurent- sur- Mer. ALG A-1 was located directly behind Omaha Beach, on the bluffs overlooking the beach itself, between the small villages of St-Laurent-sur-Mer and St-Pierrre-du-Mont. Construction in earnest started on 7th June, the strip went operational on 8th June (D-Day+2) as an Emergency Landing Strip. 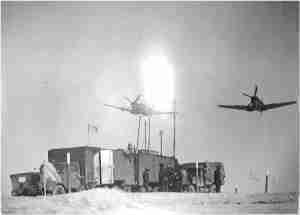 It was then upgraded to a Refuelling and Re-arming Strip, and then an Advance Landing Ground soon after. There is a remarkable photograph which is shown below which some of the RAF radar equipment and men at the St-Laurent airfield where they spent their first days from D-Day+1 to D-Day+4, with an RAF spitfire flying overhead. It was from this base, not ideal for radar coverage, but it allowed them to consolidate their position, collect new replacement vehicles which began to replace those lost on D-Day, and to get their equipment operational for the days and weeks to come. It was also from this position where some of the men who became detached from the main body of the unit were able to regroup and re-establish the cohesion of a complete unit. For instance, Muir Adair rejoined his colleagues from 15082 having arrived at the airfield site from further east, up the St-Laurent draw (as illustrated in his map below).